Mayor Hall called the meeting to order at 7:00pm. In spite of the snowy weather, all Councilmembers were present. Debbie Tarry began by commenting on the inclement weather. More freezing temperatures are expected tonight so there may be changes to some schedules tomorrow. Check the City website for the latest information. Saturday Feb 9th is Tween Night at the Richmond Highlands Rec from 6:30 to 10:30pm. This is a free event for 5th and 6th graders. Parents must sign the attendees in and out at the door. Sunday Feb 10th is the meeting of the Shoreline Social Justice Book Club from 2:00 to 4:00pm. The book is The Leavers by Lisa Ko. Public Reminder: the Planning Commission will meet Thursday Feb 7th at 7:00pm in the Council Chamber. Councilmember McGlashan and Deputy Mayor McConnell attended the SeaShore Transportation Forum. It appears that the 145th interchange over I-5 is on the WSDOT radar. Sound Transit did an update on the 522/523 BRT. The bus stop at 25th on 145th is back for review. There were no other real changes. ST is working with all the cities to get the best outcomes possible. John Hibbs, ND feels there is a real need to move the Senior services into the new Community /Aquatics center. Their social needs cannot be met by keeping them isolated. Other cities are adopting this practice and studies support this practice. Ginny Scantlebury spoke in favor of a dedicated space for seniors within the new community center. The current senior center is leased from the School District and therefore temporary. It would be easier to coordinate and avoid duplication of some activities, and cross-generational services could be offered if the senior center moved to the community center. She would like Shoreline to be a good place to grow up, and a good place to grow older. Janet Way commented on the planned use of the Fircrest property. She would like to delay any decisions in order to offer more time for public comment. It is a very complex plan and the vulnerable residents of Fircrest need our support. Changes to the property will affect the residents, neighbors and Fircrest. First and foremost, we need to protect the residents. Indira Vemuri spoke as a property owner regarding Ordinance No 849 Action Item (a). She asked that Covenants restricting new construction to single family residences be removed. (The City has no control over neighborhood Covenants. These are considered contracts between private parties/pac). Nathan Wayne commented on the need for sand trucks to make the streets more passable in the snow. Ray Burns spoke to the delay in development of his property due to title restrictions. He is in favor of Ordinance No 849 in order to remove some of these arcane restrictions. Eric Hatcher also requested the lifting of the restrictions on the development of his property on 145th. These restrictions date back to the 1940’s and are no longer relevant. The Agenda was approved unanimously. The Consent Calendar was approved unanimously. This is a required hearing on an Ordinance the Council has already adopted on an interim basis. Unless Council decides on another Action, the Ordinance will remain in effect until this spring when they adopt permanent regulations. The Staff report was provided by Julie Ainsworth-Taylor, Assistant City Attorney, by phone. The Interim Ordinance was adopted at the Dec10, 2018 meeting and was summarized by Ainsworth-Taylor. The interim regulations were amended from notification of changes to everyone within 500’, to notification of all property owners of the plat. They would be the ones who could call for a public hearing to decide whether the plat change should be made or not. A couple of administrative changes were made as well. After tonight, this will move to the Planning Commission Public Hearing Feb 21, 2019. It will then return to Council for final review and adoption. Council had the following request: for clarification for the Council and as part of public education, it would be helpful for staff to develop a one-page document explaining the difference between plat alterations and changes to a covenant, as well as the City’s role in each. This document could also include what the City does versus the State or Federal regulations regarding restrictions on race or other discriminatory limitations (terminated by operation of law). Staff will prepare this. This is just the beginning of the overall discussion of the potential underutilized property at Fircrest. Tonight’s meeting is to identify Council’s initial preferences and direction. Staff will provide an update of discussions with State Agencies regarding this property. There is interest in the State Legislature, specifically Speaker of the House Frank Chopp, to repurpose some of the Fircrest Campus property for affordable housing. It should be noted it has not yet been formally determined to be underutilized property. Assuming it is determined to be underutilized property, current City policies that come into play include the Comprehensive Plan goals for protection of the Fircrest residents, evaluating property along transportation corridors for multi-family, mixed-use, and commercial uses, and use of the excess property to create long-range jobs, annual goals to develop a Fircrest Master Plan in partnership with the State to expand economic development by creating jobs, and the PROS plan to ensure adequate park land for future generations. Ownership of the land is divided between State DNR , State DSHS, and State Dept. of Health. Does the City have any say in locating the Behavioral Health Facility? No. Once the State decides on property, the Hearing Examiner will make the decision. This is going to be a long process and we are at the very beginning stages. At this point, many things are vague. There was a long discussion of the degree to which the City want to be in control of this project.This is a very large property, with potentially conflicting interests, that Council needs to be on top of this to make sure we get it right. And we need community involvement. Do we want the Council to to act as gatekeeper? If so, then we can’t have the State apply for a Master Development Plan Permit that would be approved by the Hearing Examiner instead of the Council. Or, underutilized property could be subdivided off and treated like any other property (since no longer a “campus”). For the Fircrest Campus, the MDP will apply just like it did for Crista and Shoreline CC. If the State decides part of the property is “surplus” then the City can be a part of the discussion of the property that has nothing to do with Fircrest. However we still need to be attentive to developments in order to avoid being blindsided. We need to keep our goals and vision as part of the conversation. But a year could go by and the state comes back with something everybody hates. Does the state really want to partner with us to develop affordable housing? Or does the State see this as any business would with the bottom line first and foremost. What we really need to do, is wait for the State to decide what they’re doing with this process. James Hammond, Intergovernmental and Communications Program Manager, presented the staff report. We now have a new congress, and the government has reopened, He works with a consultant, Jake Johnston, who has represented Shoreline in Washington DC since 2003. He worked to bring federal funds to support the Aurora Ave Corridor project and to construct the Interurban Trail through Shoreline. 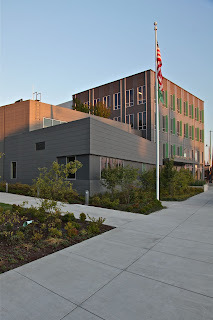 Currently funding and support for the NE 145th corridor has been a major area of emphasis. He works to support program changes for federal funding. We are not a rural area, so we must compete with large cities (Chicago, NYC for example) for federal funds. Currently, there are a lack of federal funding programs that the City can use for its transportation goals including ongoing support for the Lynnwood Link and other regional transit projects. We continue to seek support for community and economic development programs - for example, preserving access to internet-based sales taxes and supporting other municipal tax authority.